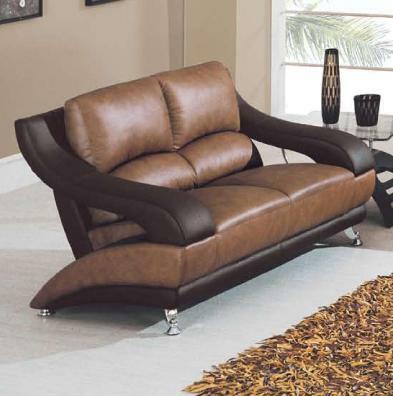 This contemporary leather love seat features modern design elements that are sure to update any room. Sloped arms, metal feet and streamlined cushions create a decidedly contemporary look on this leather love seat. Rich two-tone leather upholstery in dark brown and tan complete the love seat for an eye-catching finish that will instantly become the focal point of your home. The 928 Contemporary Leather Love Seat with Metal Feet by Global Furniture at Michael's Furniture Warehouse in the San Fernando & Los Angeles area. Product availability may vary. Contact us for the most current availability on this product. Arm Contemporary sloped arm suspended above the seat. Leg or Skirt Chrome-look metal feet. Padding & Ergonomics Plush split seat backs and generously-proportioned seats. The 928 leather collection features modern furnishings for your contemporary home. Each piece is graced with sculpture-inspired details like sloped arms, curved bases and stylish metal feet. The sofa, love seat and chair all feature plush divided seat backs and generously-proportioned seats that invite you and your guests to sit down and relax. 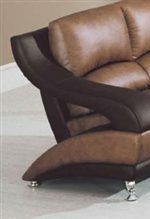 A rich two-tone upholstery includes dark brown and lighter tan leathers for an eye-catching seating group that is sure to be the focal point of your living room. The 928 collection is a great option if you are looking for Contemporary furniture in the San Fernando & Los Angeles area. Browse other items in the 928 collection from Michael's Furniture Warehouse in the San Fernando & Los Angeles area.